1902 - 1983 (81 years) Has 294 ancestors but no descendants in this family tree. 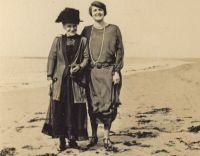 The youngest child of the family, she could not really remember her biological mother but enjoyed a good mother : daughter relationship with her step-mother, Emma. Fern House shown to be a 5 roomed house. "Denton, Ethel Florence of Hill House Hospital Minster Ramsgate Kent died 4 August 1983 Probate London 18 November Not exceeding £40000 830215022X"
Hill House Hosptial used the building erected as the Thanet Union Workhouse, so Auntie Ethel died where her great grandfather had died just over 100 years earlier. My great grandfather Herbert with his second wife, Emma nee Dickinson, his youngest daughter Ethel (next to him) and 2 others - only related to Herbert by the marriage of my grandparents (i.e. Herbert's son Charles to 'Dolly' Inman). 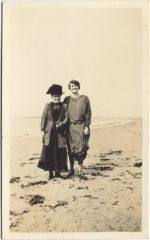 The girl is Audrey ('Peggy') Dollimore and also present is her mother, Em nee Shaw - a first cousin of my grandmother's.